Due to the programmable relay PR114 users can cost-effectively implement from simple to complex control tasks in various application areas. Universal input and outputs as well as the universal power supply make the PR114 particularly flexible. Free akYtec ALP software is used for programming. Beside the eight digital inputs and also the four digital outputs the programmable relay PR114 has four universal inputs and four universal outputs (digital/analog). The universal power supply (24 V DC or 230 V AC), which is built in the PR114 relay, provides flexible use and facilitates storing, because only one version is to be maintained. For implementing complex projects, the PR114 also has extensive hardware resources such like retain memory. Based on the integrated real-time clock, different tasks with a time reference can be implemented. If necessary, the relay can also be integrated in a RS485 network as a Modbus slave. What is needed for is just a PR-MI485 interface adapter connected directly to the relay This adapter doesn't require its own power supply. The programming of this mini PLC is performed with the freely available and easy to use programming environment akYtec ALP with FBD programming language (IEC 61131-3). This programming environment is available for free and is supplied with the programmable relay PR114. AkYtec ALP software allows creating your own function blocks and macros or use already existent. For this aim, the manufacturer has integrated in the programming environment online database, due to which the user can download pre-built macros of akYtec (or by other users) for free. Moreover, the software offers a simulation mode and a full overview of resources utilization and their availability in the current project. 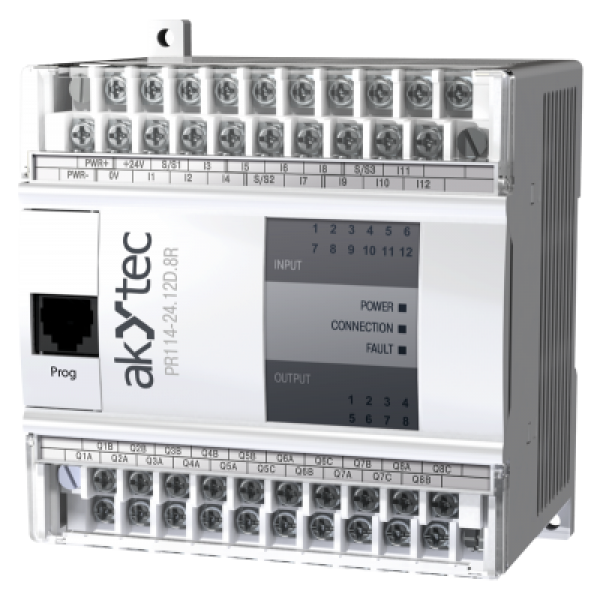 For transferring an application to the control relay PR114 akYtec offers the programming adapter PR-KP20. This adapter allows connecting the relay with a PC directly over a USB 2.0 port of the PC. The PR114 is delivered in housing for DIN rail or for wall mounting. Plug-in screw terminals at the upper and bottom side of the device enable to replace them without disconnection of signal cables. akYtec GmbH from Hanover, Germany develops and distributes innovative automation technology and industrial electronic products. These include various digital displays, control panels and programmable relays.